With the launch of The West Tower, Ayala Land Premier offers buyers a final chance to be part of its uncommon urban sanctuary, One Serendra. The combination of a unique location in Bonifacio Global City (BGC), a flourishing environment within, and graceful spaces makes The West Tower at One Serendra a truly singular residence. 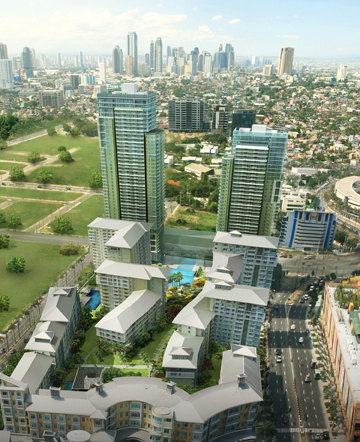 “In the West Tower, we are combining the comforts of larger, more thoughtfully planned living spaces, greenery and open spaces usually found in subdivisions with the conveniences of access only an urban location like BGC provides,” says Rex A. Mendoza, Senior Vice President and Chief Marketing & Sales Officer of Ayala Land. One Serendra is nestled in an urban oasis at the heart of the Bonifacio Global City, one of the most progressive commercial districts in the metropolis. Known as “The Home of Passionate Minds”, BGC fosters the harmony of work, home and play set in an open environment as rich in natural greenery as it is with the vibrancy of life. To be a part of the One Serendra community is to live with the convenience and excitement of an urban lifestyle and to experience day in and day out the tranquility of a suburban neighborhood. The low-rise clusters of homes, the East Tower, and soon, the West Tower that make up One Serendra form a refuge for its residents from the busy world outside. West Tower Cam04_from 32nd St. The green landscapes and flowering gardens surrounding One Serendra open up to the trendy commercial complex of The Shops at Serendra, continuing on to Bonifacio High Street. Here, fashionable retail and dining outlets give residents and well as visitors a place to dine, relax, mingle and even walk their dogs. However, if one were to prefer to look for sanctuary, the grounds of One Serendra offer a variety of options. At completion, half a hectare of fitness and wellness facilities will be available: including an exclusive spa to residents, multiple pools, courts and a putting green, or one may simply decide to stroll around the gardens, or sit in th gazebo by the koi pond. Entertaining is also easy with multiple social venues available to host parties of various sizes. Above all, the West Tower offers an enhanced sense of gracious suburban living. “With a home that rises 50 stories above the city, you can easily slip into your sanctuary in the sky at the West Tower,” Mendoza says. Floor-to-ceiling windows in each living room and private balconies in almost every unit present a view of the cityscape below like no other, and also bring in plenty of natural light and ventilation into the homes. There is room to breathe as consideration for freedom of movement, and, ultimately, ease of living, is given to every layout. “Each home feels spacious, light and airy — each home is detailed to provide homeowners a sense of abundance – in terms of light, natural ventilation and well-being,” Mendoza says. The space and light enhance the premium finishes of each unit as well. Engineered oak and stone floors, granite countertops, homogenous tiles and bath fixtures from Kohler or Grohe, Blum pull-out drawers in main kitchens are just some of the carefully appointed features of the West Tower’s units. And, like the East Tower, limited edition units are available at the topmost floors Sky Pool or Sky Garden residences. A Sky Pool unit indulges its residents with a dip in a plunge pool in the privacy and comfort of their own home with a view of the horizon. The Sky Garden unit affords more space for relaxation, a place to ponder over views of the horizon or maybe a cocktail party at sunset. The West Tower Garden units would be just as special as living on top. They come in a one-bedroom garden terrace, one-bedroom garden flat, one-bedroom garden loft or a one-bedroom atrium unit. Each unit is designed to maximize natural light and feeling of space, with some units having 13-foot high ceilings. “One Serendra is the perfect setting for the rest of your life,” Mendoza says. Inside your home is a lush garden while the city awaits just outside your doors.” With the perfect balance of city living and suburban lifestyle, life couldn’t get any better at One Serendra.